Wednesday’s child is full of things and if you’re bigger you fall a bit faster…. someone just discovered an old VHS tape of a Cardiacs performance from back in 1984 and for no other reason than for the glorious beauty of it all, Cardiacs, a band we hardly ever mention, will be Wednesday’s thing of the day…. … what is that third song? Sounds like something unheard if don’t count the couple of lines that pop up at the end of the original version of R.E.S…. It’s a great thing you mention Cardiacs at least! They’re play in a league of their own! Does this Kingston ’84 VHS video contain the whole set? If so, how about running off some DVDs and giving us the chance to buy them? hi, i uploaded this film from an old vhs. the third song has bits of ‘hope day’ from the seaside cassette with different words, so i guess it’s an early version of that. glad you liked it. thanks Nick, that third song obviously sounds like bits of Hope Day, as if Hope Day evolved out of it, but you may have something rather special captured there. Question is, is there anymore to that VHS? 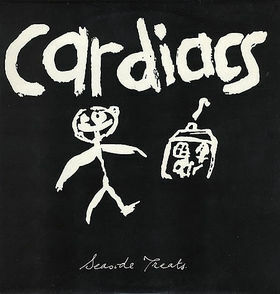 the three cardiacs songs were the only ones on the film. i also have a couple of songs from the trudy.